NYC Shrink Wrapping is here for you when the worst happens in terms of weather or other roof emergencies. While tarps can be used as a quick fix, they can also leak and blow off leaving you with even more damage to your roof or interior. 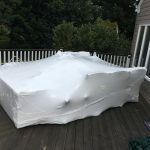 With emergency shrink wrap for repairs, we can provide an air and watertight barrier from the weather, so that you, the homeowner, and the insurance company can rest assured that you’re protected while the needed work can move forward. The NYC Shrink Wrapping team has worked with both commercial and residential customers that have had emergencies and needed to be covered and protected from further damage. If the unthinkable happens, look no further than NYC Shrink Wrapping for your emergency shrink wrapping needs.